Which stock is likely to provide the best risk-adjusted return? It’s the fifth and final round of our March Midness mid cap stock tournament. So far in this tournament, we’ve used criteria from the categories of growth, financial health, efficiency, and competitive advantage to help us narrow the original list of 32 stocks down to just two potential champions: Taro Pharmaceuticals (TARO) and Maximus (MMS). Both have proven themselves to be potentially very strong contenders for long-term portfolio picks. To determine the winner, we’ll be looking at valuation and volatility (risk) metrics to see which stock is better priced and safer. We have four simple tests, awarding one point to the winner of each test. First, we’ll create valuation and volatility scores using ranked screeners, just like we did with growth in Round I. Then we’ll compare their max drawdowns in a 2-year chart. Finally, we’ll see which stock has a better risk-adjusted performance. TARO scored a 63.5 while MMS scored a 42.9. 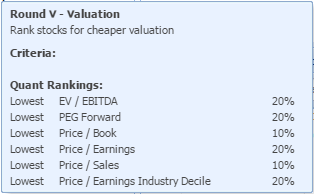 A definitive win on valuation for TARO, and a point awarded accordingly. Once again, TARO wins, but only by a three-pointer, 55 to 52. The left side of the table contains valuation metrics, where you can see that TARO is cheaper in all but Price/Sales. Maximus has a much higher P/E multiple, although it is still is in the top 40% of its industry, according to the P/E industry decile. 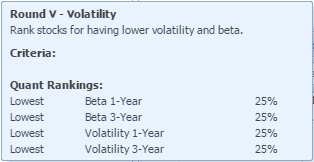 On the right side of the table, we see that the two appear to be pretty close in the 1- and 3-year volatility and beta metrics. Neither are especially volatile, and over the 3-year period, TARO’s price moved up and down at only about half the rate of the market. TARO hit a new max drawdown on the day of writing. Its previous max drawdown (which is what we saw in the March Midness webinar I hosted on March 31st) occurred a few months ago, and was also in the 18% range. Okay, so TARO is 3 for 3 right now, meaning it has this in the bag. But let’s go through our last test anyway: 2-year risk-adjusted return. As you can see…TARO wins again! A clean sweep of Maximus in the final round. Incredible! Both TARO and MMS beat the S&P 500 over the last two years, but only TARO did so with enough of a margin to outpace its risk. On a hot streak for the entire tournament, our #1-seeded stock TARO is this year’s March Midness champion. Could it be a champion for your portfolio? It certainly looks like it could be, at least based on its quantitative game. Later this month, I’ll revisit TARO and dive in deeper on those qualitative factors to see if we’ve found a stock that is strong in both body and mind. Meanwhile, a number of other mid cap stocks showed some pretty good stuff in this tournament, too—MMS, OTC.TO, GNTX, and PII all looked good, just to name a few. These and several others from the original 32 (available as a watchlist in the Library) might be worth a closer look if you’re in the market for a mid cap this spring. Thanks for reading. I hope you enjoyed the tournament!